Pan-Appan, pseudonymous author of the story "On a Train with a Madman," remains a mystery, but after hearing from German fan and collector Lars Dangel earlier this year, I am closer to solving the mystery. I want to acknowledge and thank Mr. Dangel for his contribution. I hope that what I write here will help move us all towards a more complete biography of Pan-Appan. In my posting from January 20, 2012, I wrote that "On a Train with a Madman" was originally published in a German volume, Seltsame Geschichten: Grotesken und Phantasmagorien dem Reiche der überirdischen Welt, and translated for publication in Weird Tales (July 1935) by Roy Temple House. I also provided a description of a copy of Pan-Appan's book offered for sale on the Internet. An anonymous reader translated that description. (I would like to acknowledge and thank that reader as well.) The description suggests that Seltsame Geschichten: Grotesken und Phantasmagorien dem Reiche der überirdischen Welt (Weird Tales: Grotesques and Phantasmagorias from the Realm of the Supernatural) was originally published in 1910 and that either the original edition or that particular copy was rebound in 1927. So we know a little more about the book. What about its author? Pan-Appan was the pseudonym of an author named Hermann Plahn. (The source below gives his pen name as "Appiani.") Plahn was born on March 2, 1865. After the death of his parents, he moved to Potsdam, where he attended high school. A chemist and writer, he penned two plays, Carthalo, historisches Drama (Carthalo, A Historical Drama, Appelhans and Pfenningstorff, 1892) and Die Wette, Lustspiel, (The Bet, A Comedy, 1892). His book Seltsame Geschichten: Grotesken und Phantasmagorien dem Reiche der überirdischen Welt was apparently published in 1910 and 1927. Lars Dangel describes it as "very entertaining and a little trashy, but that's why it is so charming." The 1927 edition of Plahn's book was issued by a small publishing house in Erfurt and distributed in small numbers and only locally. After World War II, Erfurt became part of East Germany. Consequently very few copies of the book survive. As you can see, this sketch requires a double translation, from a traditional German typeface to a more modern typeface and from German to English. I hope someone is up to the task. Another source, Deutsches Literatur-Lexikon, edited by Wilhelm Kosch (Stuttgart 1947-1958), also has biographical information on Hermann Plahn, but I don't have access to Kosch's work. 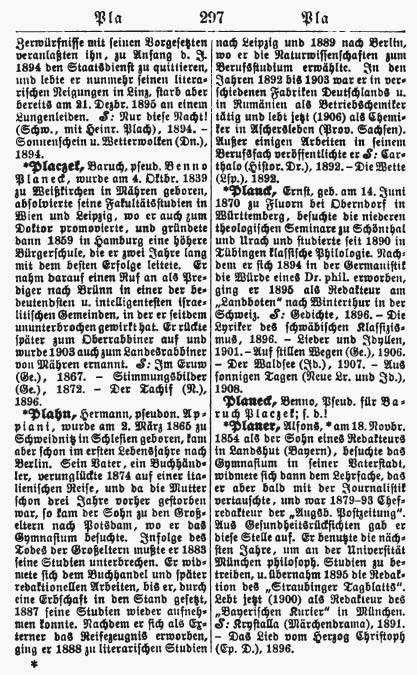 In any case, if I can find more information on Plahn, I will rewrite this whole mess into a proper biography. Stay tuned.